Specific Gravity: 2.71. This is an indication of the stone's density, calculated by comparing the stone's weight with the weight of an equal volume of water. Refractive Index: 1.57 to 1.58. This is a measure of the amount light is bent from its original path when passing through a stone. Chemical composition: Beryllium aluminium silicate. 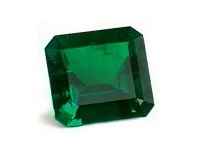 Part of the Beryl family of minerals. Principal sources: Colombia, Austria, India, Australia, Brazil and South Africa.